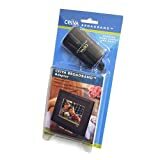 I purchased this item with a hi-res camera, and it was a lifesaver on long shoots. The ability to back up my images immediately gave me real peace of mind, and the thing really worked as advertised. 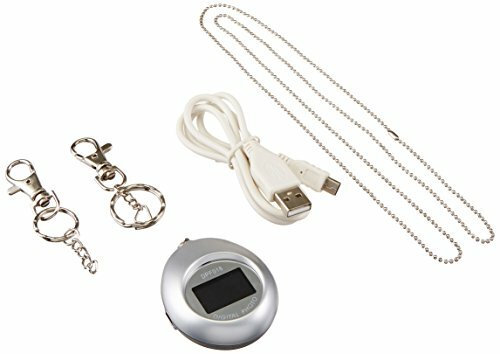 Although it would freeze every now and then, I never lost any images--the only drawback was that you had to remove the battery to restart it, as it stopped responding to all button inputs. This item shows all of your digital photos in bright, vivid colors. 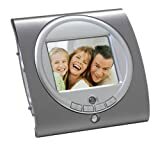 Set up a slide show and play directly from a memory card. 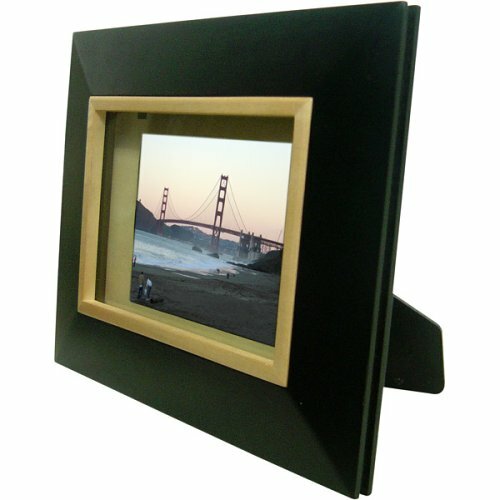 The frame is light, portable and easy to use. 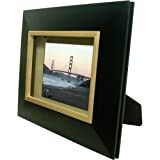 A great companion for your digital camera and is an excellent way to show off your pictures to friends and family. 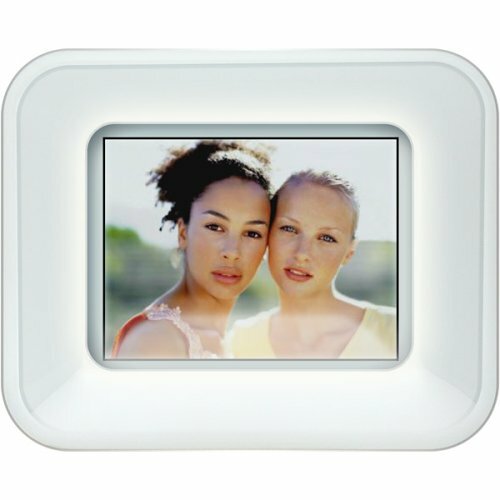 Just pop in the memory card from your digital camera and your ready to show off all of your precious memories. The frame and the pictures it displays are fine.Sometimes it is a little hard to get it to download photos from my PC.My major complaint is the power supply.The original power supply dies after 4 months.It was repalced under warranty (after some grief with customer service).The raplacement died some months later after the warranty had expired.I then had to buy one.That one died after a few months and the company didn't have the replacement in stock.After months of waiting from them to stock the item I gave up and after lots of searching on the web I found a supply made by another compay.I had to change the connector to make it match the connector on the frame.It's been doing fine since then.I should note that my daughter has the same frame and has had almost identical problems.It looks like there are a lot more of these types of frames on the market now.I would do a lot of shopping before buying this one! 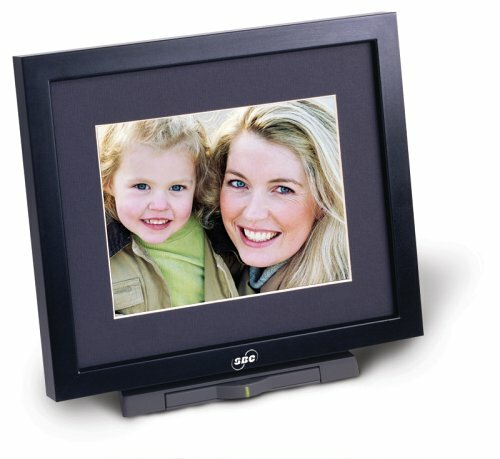 Good product, probably the best digital frame in the market. 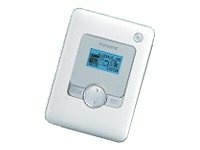 Drawbacks are the user interface and the difficulty to set-up the wireless connection. 0 but 1 is the lowest rating. Pros: Great resolution. Nice packaging. Excellent door stop. Very cool product. Screen smaller then imagined but still good quality. Could use different packaging. The box it came in made it look cheap. But overall very nice gift! 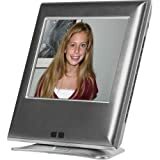 The picture frame works fine though the resolution is not so good.However, the frame has a logo at the lower right corner (like one of the review said) which is very tacky.The manufacturer should consider either removing that or replacing it with a nicer logo. I can't speak to how well the product performs because mine was DOA.Customer Service was unable to do anything over the phone.Since it was purchased as a gift and I had time before Christmas, I opted for a different brand.Doesn't inspire confidence in their quality control when a unit fails to start up fresh out of the box. 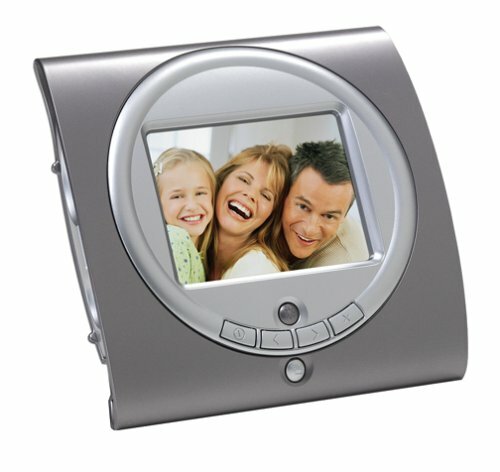 This product is extremely user-friendly and great for my parents who are not very tech-oriented.It is easy to slip the digital camera card directly into the frame, but the process of scrolling through and viewing photos is quite slow.The biggest disappointment is the screen resolution.The only photos that look good are close-ups.It would also be nice if there was the option to connect it to a computer to transfer images that way and if it had more internal memory capacity (only stores 8 photos). I was very excited to see this frame, and thought that would be a perfect gift for a fellow geek. I was extremely disappointed to see poor the picture quality - it looked like the photos were taken using one of the first generation digital cameras that came on the market some 10 years ago. The resolution was similar to my first palm pilot (IIIx), just enlarged. Clear, bright 6.8 inch TFT LCD flat screen. Easy to set up - just plug in the power adapter. Compatible with most memory cards. 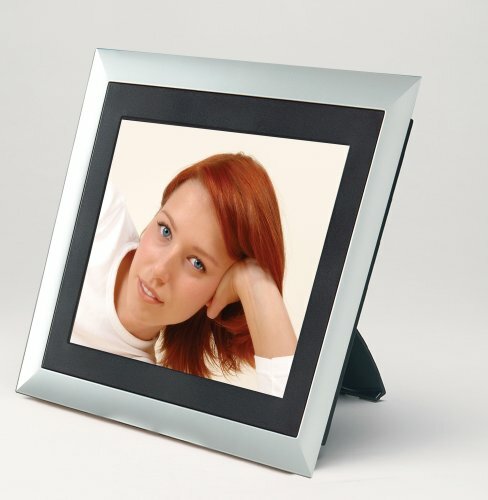 Display one picture continuously or create your own slideshows. 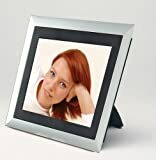 I purchased this digital picture frame after doing my homework, and reading all the reviews I could on the different kinds. The one I purchased was flawed, and would take 5 or 6 tries of inserting the memory card before I could get it to boot up. When it was running I was very disappointed with the quality of the pictures. Have to disagree with previous poster - the Vialta Vistaframe is superb.I haven't seen any pixelation on my pix.I keep the frame on my desk at work and it is much admired.I love it to pieces.My only complaint is its price, when they eventually come down in price I'll get one for home use.Also the power-saving shutoff only kicks in after 2 hours which I think is too long. The Bad:These digital frames are a nice idea, but the execution is still lacking.The resolution is 384 x 234, but the pixalation looks even worse than that - they seem to be kind of widely spaced apart which adds to the effect.As a result, the pictures look much better from a little distance where astigmatism can help smooth them out. I am NOT a photographer, and bought this as a gift for my husband. After downloading the tool which resizes and names the photos [...] I found it easy to set the frame up for use.My husband will get it next week fully functional and with a media card preloaded with some of his favourite pics.I like it! MAKE SURE YOU download rsdpv.exe or the pictures you load into it will not work! radio shack should have thought of this. 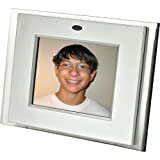 "youve got questions they got no answers"
this is definitely a low-end photo frame, and costs like it.this is no equal for frames costing $200-400. PhotoBank is a piece of junk! 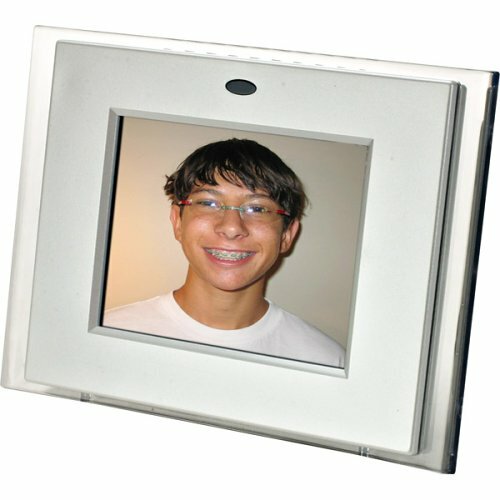 I had used the Tripper system before to store photos on my travels. I bought the PhotoBank because I appreciated its smaller size. 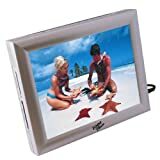 This trancend portable photobank is very easy to use, ratively cheap and 20G is large enough for most of the trip photos. Hope I can use it for 4, 5 years. Received the photo bank today. I bought it to pair with my new Sony DSC T7, which i recently got. I used to try to stay away from sony because of the fact that memory stick is not as popular as SD or CF. Since now I own one, I soon realize the issue of the memory.I have a 512mb memory stick pro duo, which comes with an adaptor to use as a regular memory stick. I later bought a 1G MS pro duo. For this upcoming xmas holiday, i will be spending 2 weeks overseas, I know that i don't have enough memory capacity for a 5MP camera. and I want a storage device to transfer the pictures directly without a computer, i don't want to carry my laptop during the trip. Can be use as a keychain or pendant. No batteries required. Available in five different colors: Red, Pink, Blue, Silver and Gray. Large, 10 in LCD screen with 800 x 600 resolution for 8” x 10” photos. No computer or internet connection required, and NO monthly fees. 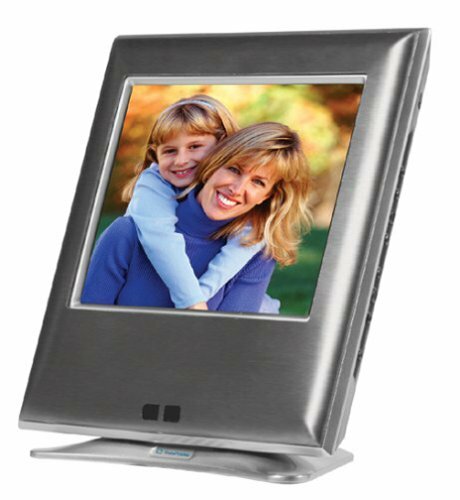 Rotating stand for vertical or horizontal placement, or mount on the wall. 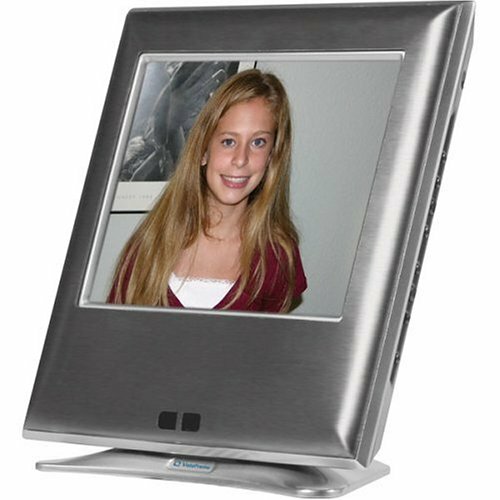 I have previously owned a DigiFrame frame that was pretty high end and very small so I tried this Digital Frame.The controls are not well explained and the photo quality is poor.There is a MAJOR blue hue to all photos. 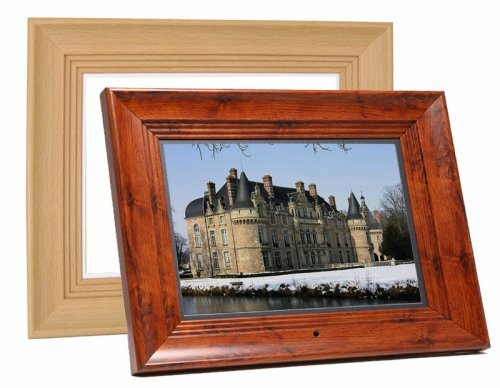 The photo quality is much better with Digiframe but the cost is almost twice as much.I would not recommend this frame, and when searching for digital frames, make sure that there are controls to "tweek" the color and brightness.good luck! Available in three different colors: Red, Pink and Blue.